Posted by Tantumblogo in Admin, awesomeness, Flightline Friday, fun, history, non squitur, silliness, Society. 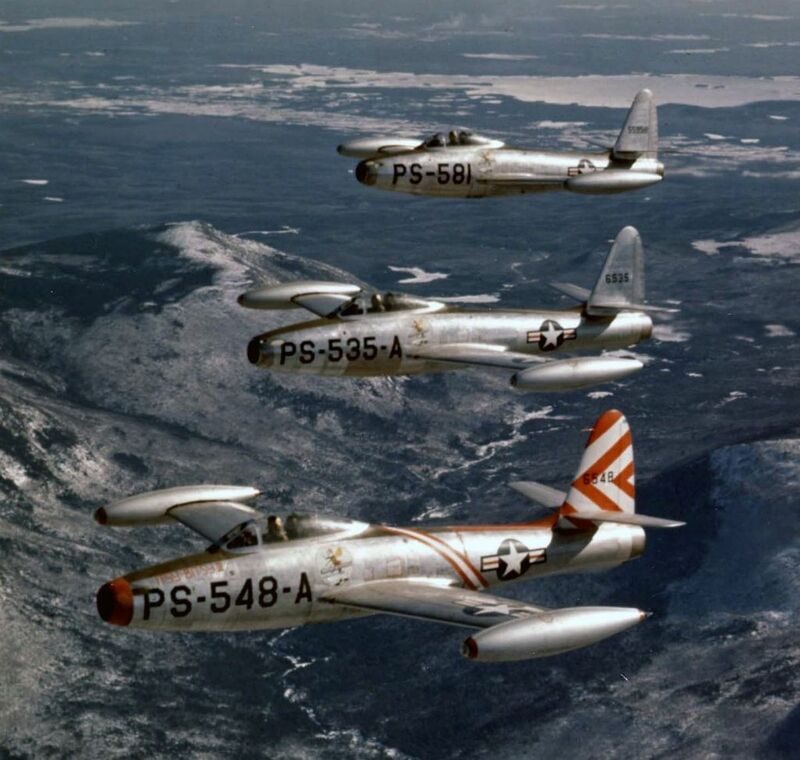 Most people who have a little knowledge of early vintage US jet fighter aircraft are familiar with the F-80 Shooting Star and F-86 Sabre. Both were stalwarts of the USAF fighter fleet in the late 40s through much of the 50s, and both served very well in the Korean War. The F-80 is notable because it was the first US jet fighter to enter service in large numbers, just barely missing out on the end of WWII. The F-86 is of course sleek and beautiful, and famous for the dogfights it engaged in over Mig Alley in the Korean conflict. But there was another USAF jet fighter of the same era that has been largely forgotten. This is the Republic F-84 Thunderjet, a straight-wing fighter bomber intended as a replacement for the WWII-era Republic P-47 Thunderbolt. 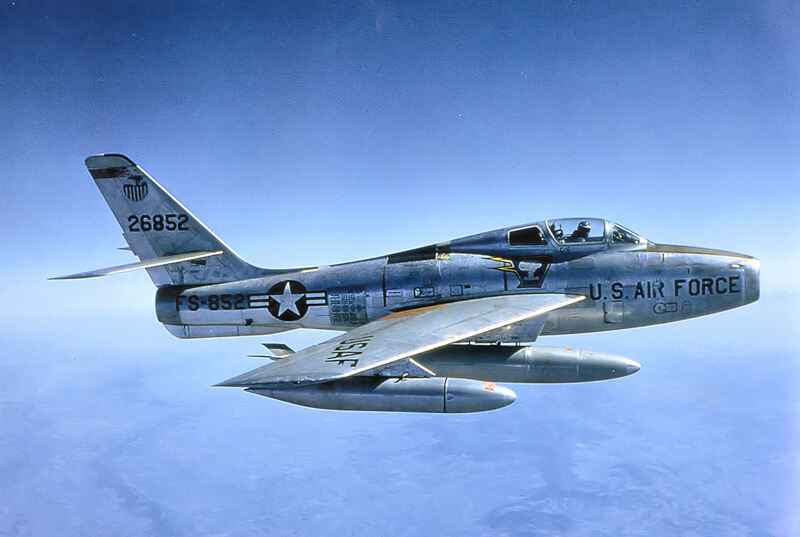 Far more Thunderjets saw service than F-80s, and the F-84 actually remained in service longer than the F-86. But, it was never as famous as its contemporaries. This could possibly be due to the fact that it was not nearly as handsome an aircraft. It had straight wings, big tip tanks, and an oddly shaped fuselage. It was also a maintenance nightmare in its early versions, which is why there were so many. It wasn’t until the F-84E, the fifth version, entered service in 1949 that most of the bugs were worked out. 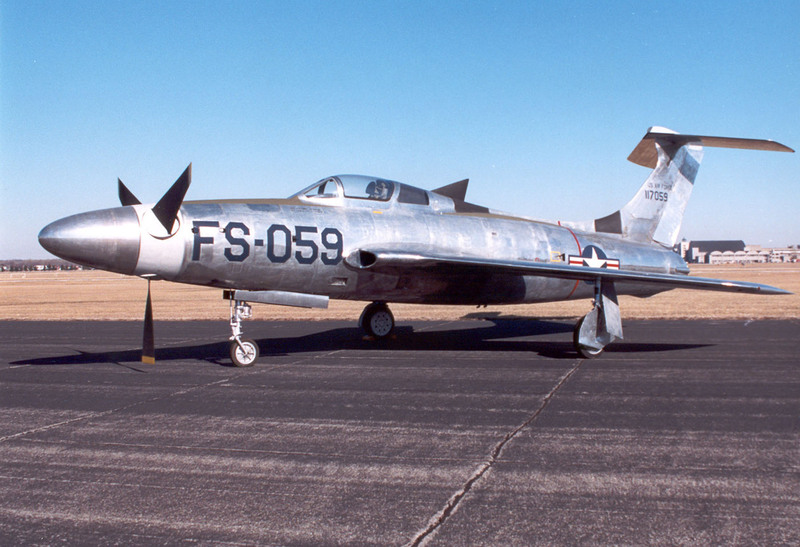 Even then, the plane failed to live up to USAF’s expectations, being about 50-100 mph slower than the F-86. It was not much of a fighter, either. It didn’t turn very well, and could not fly nearly as high as the MiG-15 or F-86. But it could carry a bunch of bombs. So, it was used primarily as a ground-attack aircraft. In order to improve the aircraft’s performance, Republic started work on the F-84F in 1948 and had the first prototype ready in June 1950. This version differed from previous variants in having swept wings and a more powerful engine. Performance increased markedly, so that the F-84F was about as fast as an F-86. 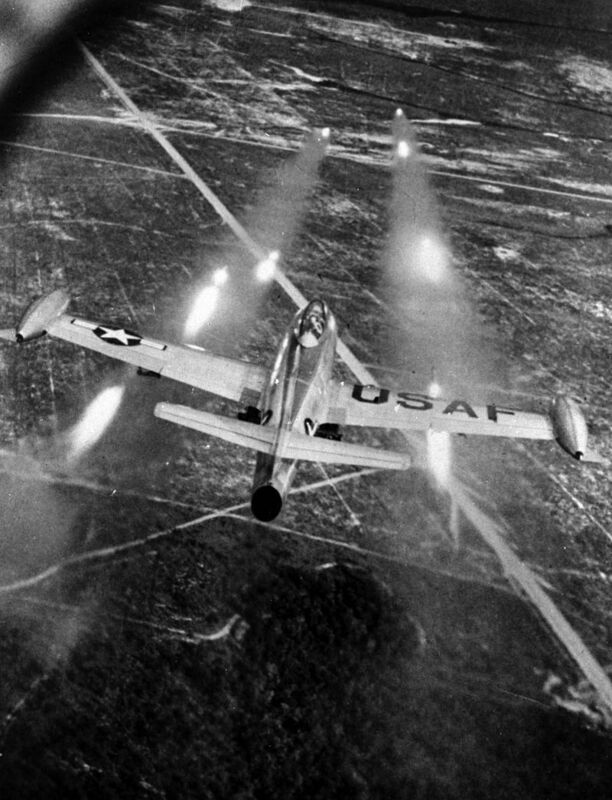 However, there were enormous problems in development and the F-84F did not enter service. In addition, the early jet engines were very inefficient, which meant that range on the aircraft was still not what USAF wanted. However, there was an alternative to pure jets that might provide about as much speed, but also much greater range. That alternative was to put a turbo-prop in the F-84 and equip it with special supersonic propellers. Whenever you see a propeller driven plane today, the tips of the propeller are turning at much less than supersonic speed. However, as prop-driven aircraft reached their zenith of performance in WWII, power limitations began to creep in when the propellers turned so fast they were nearing supersonic speeds. As the propellers did so, the then-current designs would begin to fail, with the propeller stalling and power falling off dramatically. However, after WWII, knowledge of supersonic airflow improved enough that it was thought possible to design supersonic props that would not stall out or experience power loss. It was thus decided to equip a new version of the F-84F with a turbo-prop and supersonic propellers. The Thunderscreech was born. It was hoped that it would be a simple matter to mate the new turboprop engine and propeller to an F-84F and that a long range fighter-bomber with nearly the speed of the -F model could be turned out quickly. That did not happen. Because of the incredibly turbulent airflow expected from the supersonic propellers, the horizontal stabilizer had to be moved to the top of the tail. Then there were all kinds of problems with the Allison T40 turboprop powerplant. It never made the advertised power, and had enormous reliability problems. These problems and more delayed the first flight until mid-1955, by which time more efficient jet engines were coming online and interest in the project was waning. Nevertheless, with the prototype complete, it was thought that the aircraft was at least worth examining to see how well it performed. The engine produced nearly 6000 horsepower. This created massive torque through the propeller, making the Thunderscreech very difficult to handle, even on the ground. But there were even worse problems with the propellers. Three tips travelling at Mach 1.18 led to a constant series of sonic bombs that blew out vehicle windows, damaged electronic equipment, and made many people violently ill. The noise was indescribable – hence, the name, Thunderscreech. 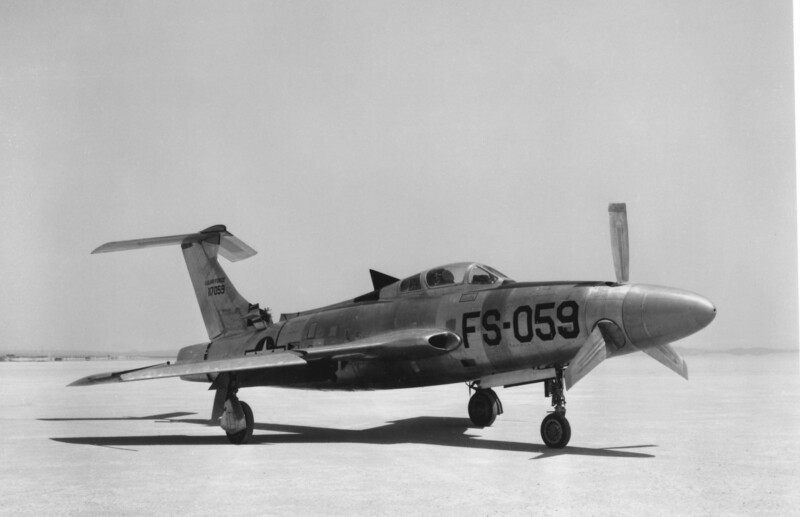 The XF-84H test aircraft is widely acknowledged as the loudest aircraft ever built. The aircraft could rarely exceed 500 mph, not because of lack of power, but because it became radically uncontrollable. On the ground “run ups,” the prototypes could reportedly be heard 25 miles away………the XF-84H’s propeller traveled faster than the speed of sound even at idle thrust, producing a continuous visible sonic boom that radiated laterally from the propellers for hundreds of yards. The shock wave was powerful enough to knock a man down; an unfortunate crew chief who was inside a nearby C-47 was severely incapacitated during a 30-minute ground run. Republic never even got through the basic Phase 1 contractor safety flights. The aircraft so disrupted other operations at Edwards USAF demanded Republic drag the aircraft miles out on Roger’s Dry Lake for testing. With the aircraft showing far from expected performance, constant massive reliability problems, and a noise that would wake the dead, the program was cancelled in mid-1956. Imagine that sucker at 180 decibels. That’d be enough to mess up my insides.